So reads the latest missive from Chris, “my guy” at the trapping service I’ve engaged to remove the wildlife from my attic. Our relationship, now in its third week, punctuates my days with high and low points, depending on the news contained in his short communiqués. Today’s information is about even. 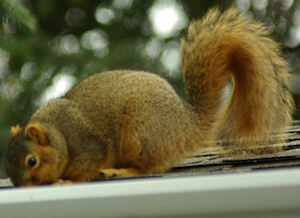 Bad news: I’ve had 5 squirrels that we know of in my attic. Good news: I now have 5 squirrels fewer in my attic. To read the rest of this saga, skitter over to the full story.